PixelBerg is a realtime viewport renderer for C4D aimed mainly at realtime artists. 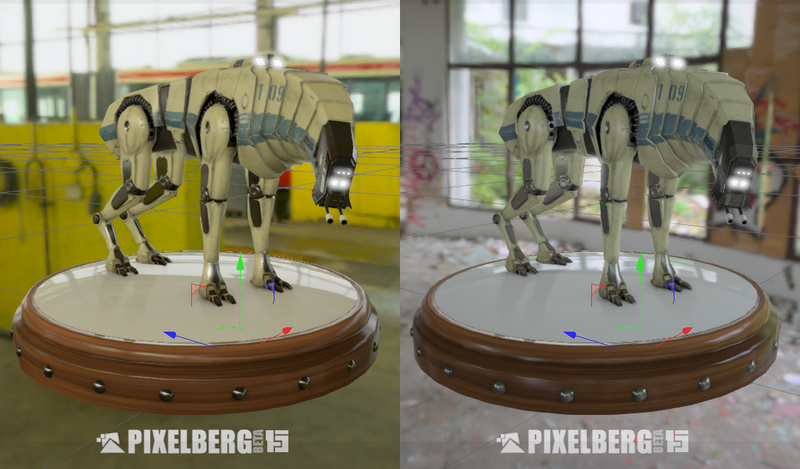 PixelBerg comprises of 3 main components which all function together to produce high quality realtime visuals in the c4d viewport by means of physical based shading, IBL and selected post FXs. WHAT IS PBS: Physical based shading (PBS) means that the shading algorithms are based on real world obsivations and physical properties allowing artists to create content that will be consistently high quality and predictable in many lighting scenarios. WHAT IS IBL: Image Based lighting (IBL) uses preprocessed cubemaps describing an enviroment to provide convincing ambient ligting and specular reflections. WHAT ARE POST FX: Post FX are just what they sound like effects applied after all the main drawing, rendering calls- These effects can be as simple as just exposure adjustments to more complicated effects like realtime amient occlusion. PIXELBERG SKY: object plugin responsable for providing the IBL lighting ,viewport background, directional light control and enviroment map conversion utility. PIXELBERG MATERIAL: material plugin which is the physical based shading component. PIXELBERG POST: post Fx plugin providing the realtime post effects. PIXELBERG WATERMARK: Bonus - post Fx plugin providing a watermark that altough it defaults to a pixelberg logo it can be easly changed by the user. PIXELBERG SKY MATERIAL: Can be used either as a shadow catcher when assigned to a plane or as a source of GI etc for standard materials when added to a C4D sky Object. PIXELBERG ENVIRONMENT RENDER: Bonus - post Fx plugin that allows you to create environment maps (spherical camera). DISCLAMER:While great time and effort has been put into PixelBerg to ensure its usability and functionality it is important to remember that its is still in a beta stage and thus requires the following disclaimer: The software is provideded “as is”. I do not give any warranties, whether express or implied, as to the suitability or usability of the software. I will not be liable for any loss, whether such loss is direct, indirect, special or consequential, suffered by any party as a result of their use of the software or content. Use of the software is done at user’s own risk and the user will be solely responsible for any damage to any computer system or loss of data that results from such activities. Turntable animation of model with 2 different enviroments. The screen recorder seemed to slowdown viewport animation abit. I could ofcourse have rendered this out by setting the render engine to hardware but i want to emphasize that this is what the viewport output looks like. exelent, work fine, and very intuitive. I hope the option to make render, to create , super fast renders, a great alternative to video copilot 3d elements. Absolutely beautiful. I hope that it will be regularly updated.